2NaCl --> 2Na(l) + Cl2(g). Modern Downs cells operate at 25 to 40 kA and at potentials of 7 to 8 volts. 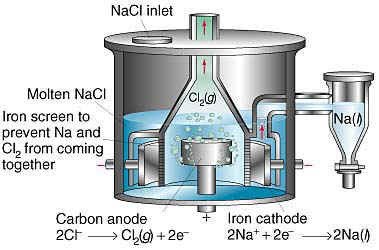 The actual difference in reversible potential between sodium and chlorine under industrial conditions is only 3 to 4 volts, almost the same as the difference in their aqueous standard potentials (4.0745 V). The rest of the applied potential (nearly half) is used to overcome the iR drop due to the cell resistance and the overpotential for chlorine evolution. The Downs cell is the major production process for sodium metal and is a minor source of industrial chlorine.